You know when you’ve chosen a combination of plants (promising an explosion of fiery reds) and picked out the absolutely most perfect container (glossy blue) to showcase your selection and then you stick all the plants in the pot and they start to grow and fill out and the whole thing turns into something completely different than what you thought it was going to be? Yeah, well, that’s exactly what happened with this container recipe I concocted last year. But I’m sharing it with you anyways because although the final result, shown in these photos taken last July (2016), is not at all what I was expecting it would be, I liked it anyways (in all its strange glory) and I hope you do, too. I think my biggest surprise was when the Empress Of India nasturtiums didn’t spill over the lip of the container as I assumed they would. Instead, each stem grew straight up to hold aloft a fat green leaf like a perky parasol. The Superbena® Royale Romance, a Verbena hybrid new for 2017 from Proven Winners, turned into the trailer in this combo, which was a nice accident because the velvety deep burgundy blossoms looked gorgeous against the sides of the dark blue pot. (You have to go see this plant for yourself at your favourite garden centre. These photos don’t do it justice; no matter what exposure I tried, I couldn’t capture that wine-red hue.) And the fiery Graffiti® Red Velvet Pentas, delegated as the ‘thriller’ of this grouping, just couldn’t compete with the nasturtiums and decided to lay low. 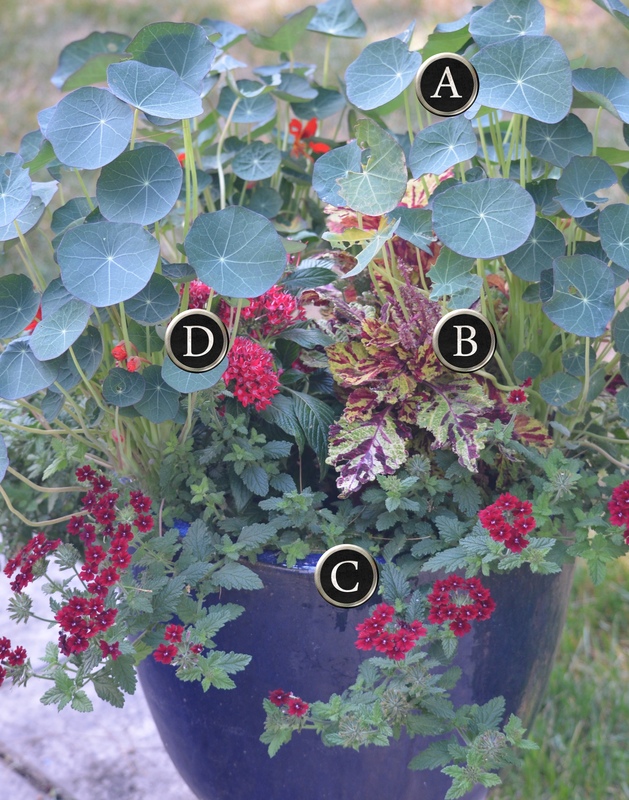 LOOKING BEYOND THE CONTAINER: Empress Of India nasturtium is an heirloom plant with edible flowers and leaves. I learned a lesson with this beauty: Always look up the growth habit of a plant before assigning it a spot in a container planting. I’d assumed it would make an excellent trailer, remembering all the other nasturtiums I’ve planted in containers and hanging baskets that immediately created lovely hanging curtains of green foliage studded with orange blooms. The Empress Of India actually has a mounding habit. For that reason, this nasturtium also makes a lovely ground cover in a large flower bed. A FILLER THAT STAYS THAT WAY: The Fairway Coleus series, which includes Fairway Mosaic, is an extra dwarf variety meaning that these plants only grow up to about 8 inches in height. Because they won’t shoulder their way up in a container, they’re a handy option for filling in a container combination with lots of colourful foliage. They’re also very late flowering so you can depend on them not to overshadow the flowers you chose to be the stars of your show. A NEW VERBENA TO ADD TO YOUR PALETTE: The Superbena® series of verbena hybrids is heat tolerant and mildew tolerant–both terrific attributes you want in a container planting. Another bonus is that they can tolerate drier soils if you happen to forget a watering before heading out for a weekend at the cottage. But I’d seek out ‘Royale Romance’ in particular for its extraordinary colour. Think of a glassful of a delicious Cabernet Sauvignon (as I so often do) and you’ve got some idea of this verbena’s gorgeous colouring. 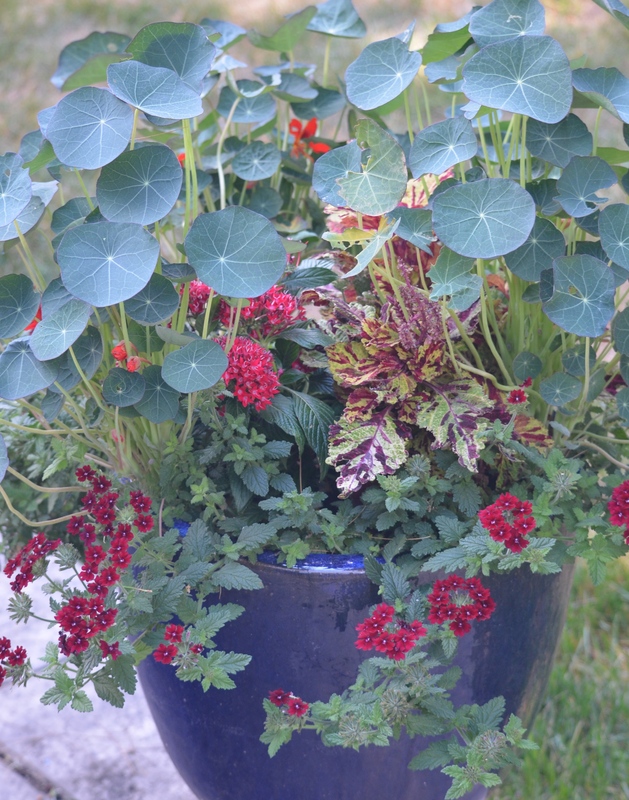 • Try this container combo on an east or west-facing patio. If you’ve got a patio that doesn’t get a full day’s worth of sun, like one that only gets morning or afternoon light, and you want to add some colour, this is the container recipe for you. Although pentas prefer full sun they’re okay with some shade and the other three plants are happiest in part shade. • But don’t let this baby bake. Although the pentas and verbena are heat tolerant, the nasturtiums and coleus may struggle in a baking summer sun. So if you’ve got a west-facing spot that really heats up by the end of the day, you might want to move this container into a sheltered area during the dog days of summer. • This combo is a magnet for butterflies and hummingbirds. You’ll get lots of flying critters coming for a visit and lighting up this bright combo with even more eye-catching colours. The pentas, nasturtium and verbena all attract butterflies. The nasturtium blooms will also attract hummingbirds. 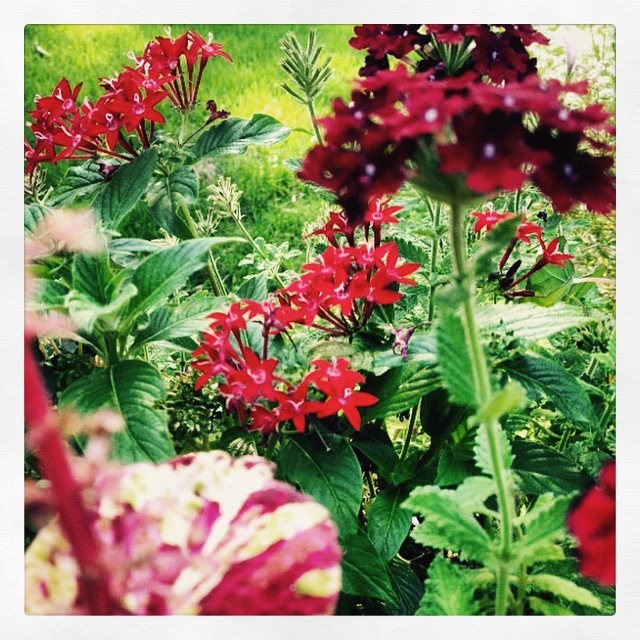 Want more ideas for a container planting featuring fiery red flowers? Try my suggestions here featuring more Proven Winners plants I was asked to trial: Container idea: Firecrackers and red hot petunias.